Last weekend, I lead my annual Photographing the Oregon Coast workshop which was a ton of fun. Not only did we have amazing weather, the participants were extremely fluid and enthusiastic. 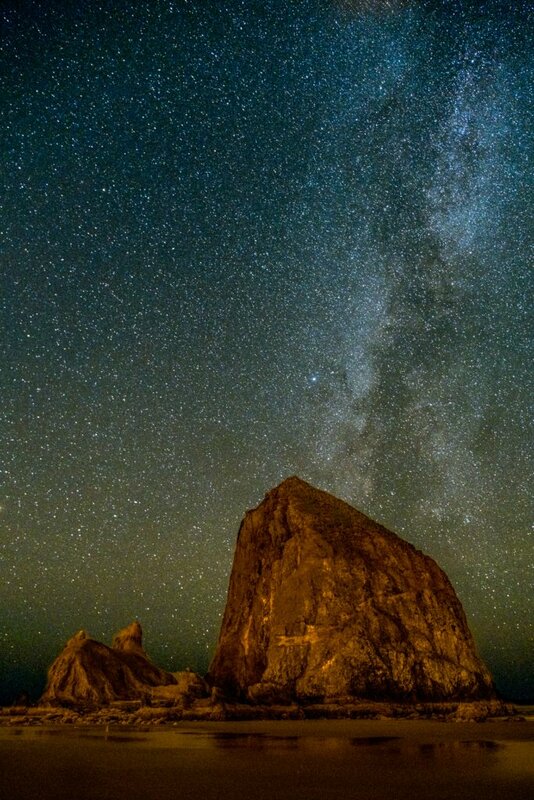 Though it wasn’t on the initial itinerary, we ventured out one evening to shoot the Milky Way as it hovered over Haystack Rocks at Cannon Beach. Astral Photography is not something I’ve had much experience with but I gave it a shot and fell in love with it. I shot until well after midnight and had one of the students not pulled me away and reminded me of our sunrise shoot that same morning, I could have stayed out for hours more. This image is the result. Photographing the stars and Milky Way is not an easy task. First, you must find a suitable and interesting foreground. That was easy in this case as we had the rocks. Also, it has to be dark. My shooting was interrupted by beach walkers with flashlights, wandering dogs wanting some love and beach security combing the area with high powered lights. Then, there’s focusing and composing in pitch dark conditions. What I did here was set my camera (X-T3) to the highest ISO possible (12,800) at 1 second shutter. Shoot, check the composition, reset the scene and shoot again. Repeat, repeat, repeat until the composition is what I wanted. Unfortunately, I only brought at 2.8 lens where a 1.4 would have been preferable. The standard rule is lens focal length/500=shutter speed so in my case, at 24mm, I shot at 20 sec without elongating the stars. I think 10sec would have been better. I shot at 3200 ISO for the sky a cooling white balance. I then shot for the foreground at 3 minutes at 100 ISO with a warming white balance. I then combined them in Photoshop. It took me 10-12 tries as we’re talking about long exposures and, as you know, the earth is moving so the Milky Way continued to change position on me thus I had to move 15-20 feet to the left every 15 minutes or so. I think the result was worth the effort. Can’t wait to do more!